How do you celebrate after the greatest and most important day of your life?…With a honeymoon trip of a lifetime! What exactly does that mean? How about a 2 week trip visiting 5 countries (my wife will say 4, does being on a river in Zambia and seeing elephants count as visiting a country?). This included visiting one of the seven wonders of the world, seeing one of the seven natural wonders of the world, and going on a week long safari. Lucky for me, I married someone who loves adventures. Not surprisingly her biggest adventure wasn’t our honeymoon, but was allowing me to completely plan our honeymoon. I constantly teased her that we’d be staying in hostels and eating Peanut Butter sandwiches the entire time in order to afford the trip. But since it was our honeymoon I decided to trade in the tents and hostels for hotels and switch the PB&J’s out for restaurant food. Uh, staying in nice, comfortable private rooms and eating amazing cuisine…What has marriage done to me? Honeymoon Tip: Just two quick pieces of advice: 1. If you’re planning a honeymoon, I highly recommend you wait a couple of weeks after your wedding so you can be rested and fully able to enjoy your honeymoon. 2. If you can afford it, take a trip that you’ve both always wanted to take, no matter how crazy, long, or expensive. Now is the time to take that dream trip because you never know what will happen in the future…like getting pregnant half a year into your marriage…not speaking from experience. Trip Idea: My love of Africa, which came from spending 4 months in South Africa, combined with Courtney’s love of the Lion King resulted in our idea to go on safaris in Botswana and Zimbabwe. Trip Summary: I wanted to show Courtney a little of South Africa before our safaris so I booked our flight from Houston to South Africa. For $100 I routed our flight through Egypt with a 2 day layover so we could see the pyramids and other sites. Travel Tip: Find flights that have a layover in another place you want to visit and then do an extended layover. This often costs very little so it’s like taking 2 trips for the price of 1. We spent 2 days in South Africa and then flew to Botswana. After 4 days of safaris we drove to Zimbabwe for another 3 days of safaris. In addition to the safaris, we did an elephant ride, visited Victoria Falls, and walked with lions. For us, mixing in other activities in between safaris was the perfect combination. This may seem like a jammed pack trip with a lot of traveling, but we did everything we wanted to and still made sure we had plenty of down time to relax. Our honeymoon was the perfect way to get our adventure together started. The next few posts will be about our trip of a lifetime. 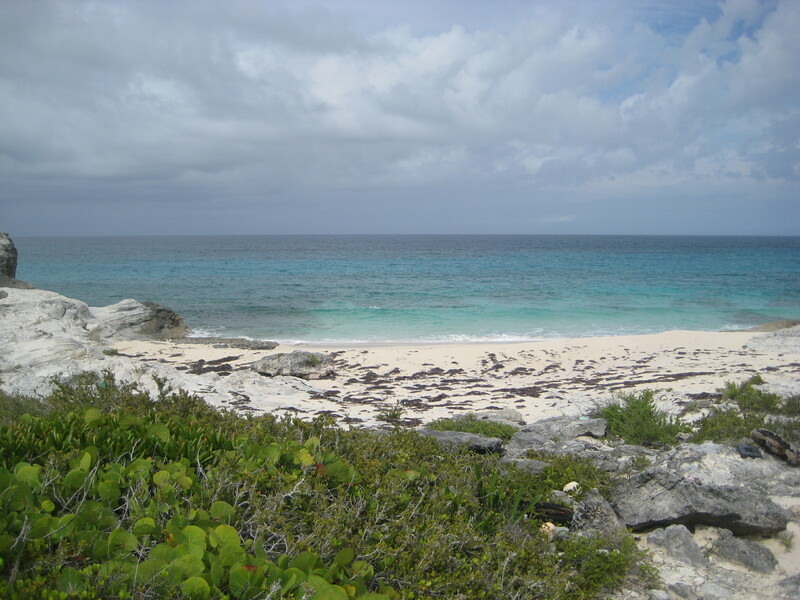 As I exhaustedly laid down in the sand on an uninhabited island in the middle of the Atlantic, I thought to myself, “I think I’ve made a huge mistake and bitten off more than I can chew.” I had spent 4 days island hopping from island to island in the Bahamas. That sounds like paradise, right? Well as usual, I decided to take my trip to the extreme and kayak by myself from island to island. No, I’m not a professional kayaker. I did get my Eagle in Boy Scouts, but it wasn’t for my navigation skills! And let’s just say more than 1 person told me I was crazy. “A storm could capsize you!” “You could get lost!” ‘What if you get injured?” “A shark could jump out of the water and bite your head off”…well no one said that one, but by the time I left for my trip every other scenario had been covered. To put my friends, family, co-workers, and random people who heard about my trip minds at ease, I would tell them my training regiment. I went kayaking everyday either on Lake Houston or Galveston. Some days I went to my parents’ pool and would practice capsizing, flipping the kayak over, and getting back in. Unfortunately, I must admit I didn’t think about how ridiculous I looked until the neighbors came over and started laughing. And no, trying to explain to them what I was doing didn’t help. But nothing prepared me more than trying to make a fire with two pieces of wood. It’s a lot harder then I thought and a skill I never used. Although practicing increased my confidence in my kayaking ability, I definitely underestimated the amount of energy this trip would require. Everyday I had to take down camp, pack it in the kayak, kayak, set camp up, prepare meals, and get fires started. By the fourth day I was exhausted and thought to myself, “I think I’ve made a huge mistake and bitten off more than I can chew.” After passing out for probably an hour or two under a palm tree, I woke up and went swimming to cool off. As I look around I was amazed. There were no boats, people, or houses around. It was just me and nature. A huge smile came over my face. This was a once in a lifetime experience. To be alone on a beautiful island, swimming in crystal clear water with no one else around. Right then I realized that although this trip was really crazy, I felt a great sense of accomplishment in having come up with a unique trip and following through with it. 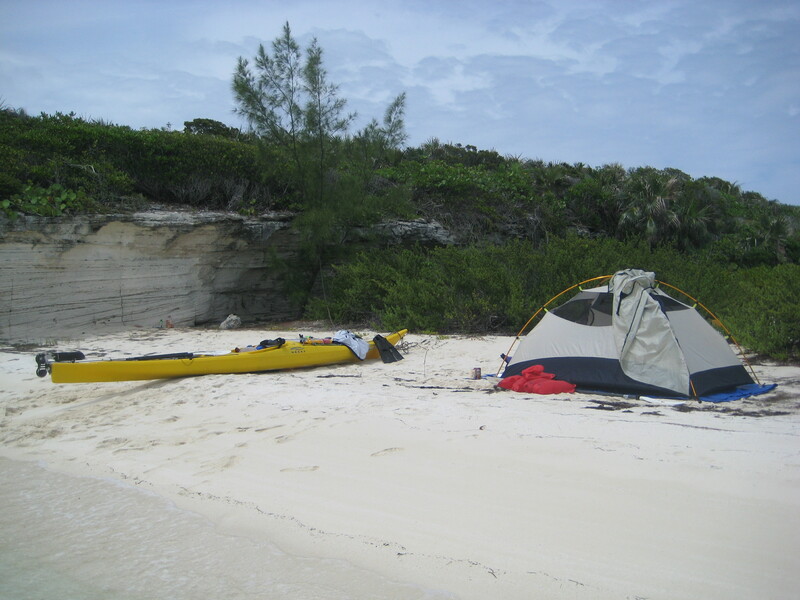 It was incredible to kayak with dolphins or snorkel and see a small black tip reef shark or sleep on the beach under a palm tree. I will admit, for some this trip may not seem that crazy or hard. For me however, it is the craziest trip I have ever taken and the best huge mistake of my life. From day one, my friend Kyle and I joked about being able to “blend in” during our time in Peru. Our second day in Peru demonstrated how awesome we were at “blending in”. When we got to the Lima Airport to go to Cusco, Kyle couldn’t figure out which trash can to throw his wrapper in. He made a circle around three differently marked trash cans with a confused look on his face. Like a good friend, I watched him struggle as he attempted to read and understand the Spanish writing on each trash can. Finally, a local Peruvian had mercy and pointed where he should throw away his wrapper. Then we went to our gate and got in line to board the plane. When we handed the lady our ticket she said, “you two are on the next flight, not this one.” It was so ridiculous. I have traveled for over 16 years and I speak Spanish, but couldn’t board the right plane. We were off to a great start of not standing out. Kyle couldn’t throw away his trash and we couldn’t board the correct flight. 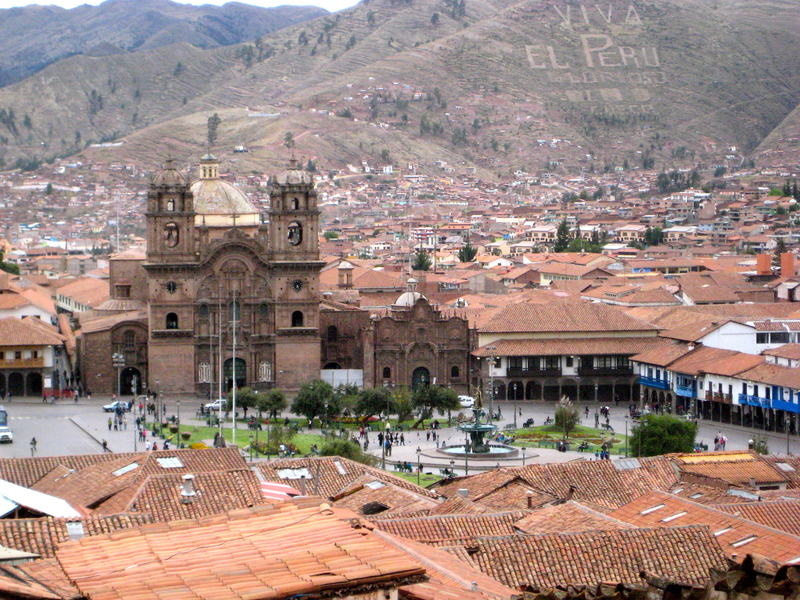 When we made it to Cusco, we were a little nervous about altitude sickness. A lot of people, both on blogs and in Peru, warned us about the impacts of altitude sickness. At the Cusco Airport our fear increased when we saw a poster of a family at Machu Picchu with one of the family members throwing up out of the frame because of the altitude. Directly after the poster we saw places where you could buy oxygen. I almost ran over to the oxygen station to buy an entire oxygen tank so I wouldn’t be like the guy on the poster. Fortunately, I realized that I was fine. The rest of the trip we blammed everything negative on the altitude. I feel that everyone overplayed the impact of the altitude. Aside from feeling out of breath and watching 80 year-old Peruvian women running by me as I labored to climb a set of stairs, I didn’t notice much of a difference. I wouldn’t worry too much about the altitude, but if you do get sick make sure to drink lots of fluids and try the coca tea. Tourists and Peruvians swear by it. Or you could buy an oxygen tank and carry it around with you. Once we arrived in Cusco we found a place to stay, and wouldn’t you know it, it was the Pariwana. 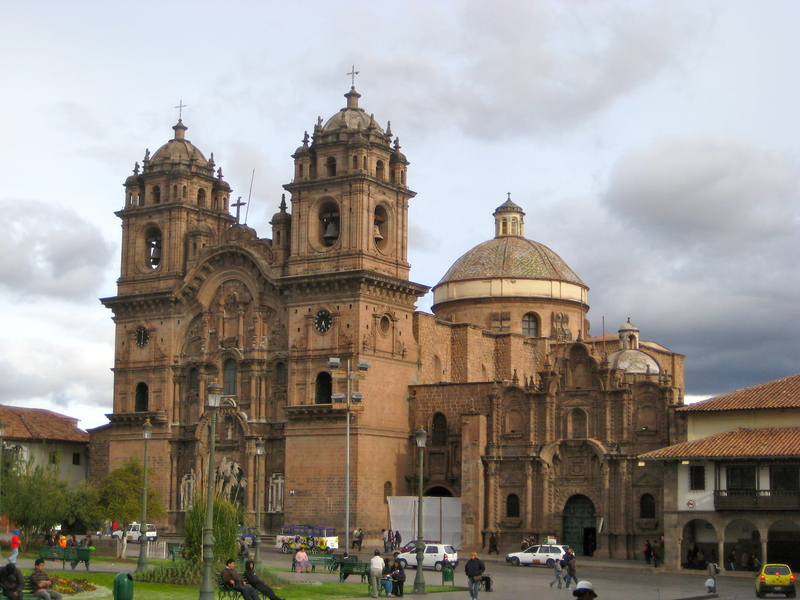 We then walked around Cusco until we found the Plaza de Armas. For anyone visiting Peru, if you ever get lost go to the Plaza de Armas. This is the main square in every city and town. I really enjoyed the plaza because of the old style buildings and two churches. There were a lot of places to eat and enjoy the view of the plaza. One place we enjoyed was Paddy Flaherty’s. It was a small pub to the right of the Cathedral. We enjoyed it because it had an excellent view of the plaza and they showed soccer. We may not have blended in, but we had arrived in the heights of Cusco. A few months ago I posted a blog about a credit card from American Airlines that would give you 75,000 miles. After receiving those miles, I wanted to take a trip unlike any other. That is when I came up with the idea to let everyone vote to send me anywhere in the world. Initially, I was very nervous because some of my idiot friends thought they’d be funny and vote for Utah. Fortunately after all the votes were counted Peru won. The only real planning I did before my trip was buying Machu Picchu tickets because they limit the number of people that can enter Machu Picchu. The night before I left, I went to hostelworld.com to find a place to stay for my first night in Lima. 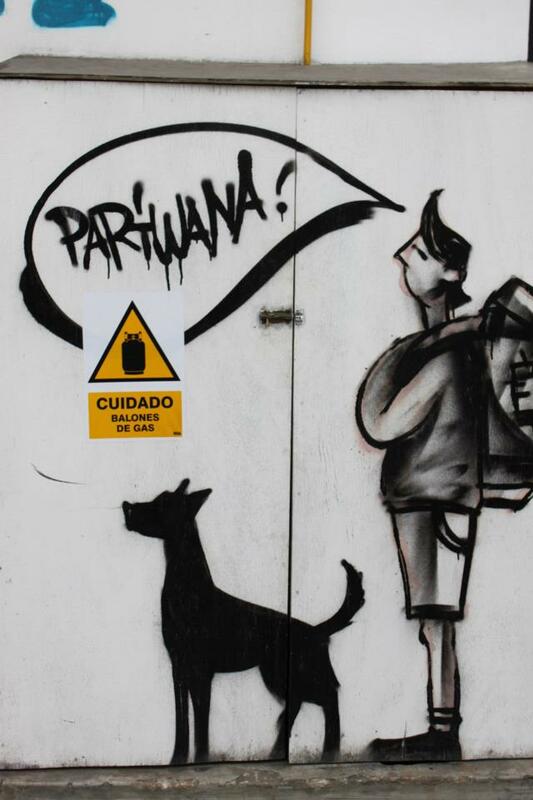 After reading the reviews and looking at the prices, I decided to stay at the Pariwana Hostel. They had me at $8 with breakfast included. At that price, I was expecting a nice buffet with eggs, cereal, fresh fruit, oj, and maybe some live classical music. To my dismay there was only bread, tea, and granolas (the people, not the food). Although breakfast didn’t meet my expectations, the rooms and bathrooms were clean, and it wasn’t too loud at night. Can’t ask for much more in a hostel. If you are going to stay in Lima, I recommend staying in Miraflores or Barranco. Both places are a little far from the airport, but they are a lot safer and there are some good things to do close by. 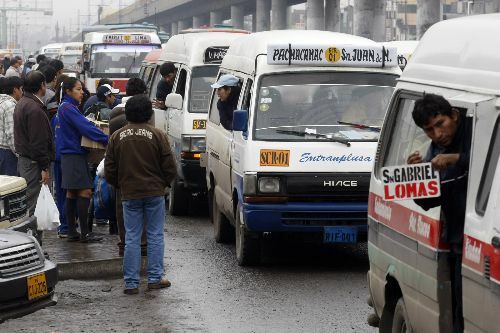 To all those adrenaline junkies, you have to go to Peru and ride in a combi. It was one of the scariest things I have ever done in my life! Riding in a combi is similar to bumper cars. The only differences are these bumper cars travel at 40 mph and don’t have bumpers or seat belts. Combi drivers seemed to go out of their way to try and hit one another. Several times we literally came within inches of hitting another van. Arriving at bus stops was the worse. They would drive really fast to the bus stop and swerve at the last minute to get in front of another driver. When they couldn’t get in front they would pull in closely to the side of another van and try to squeeze their way to the front. During my ride, I thought I was going to die in a fiery ball of carnage. Riding combis was an awesome way to begin my trip to Peru! 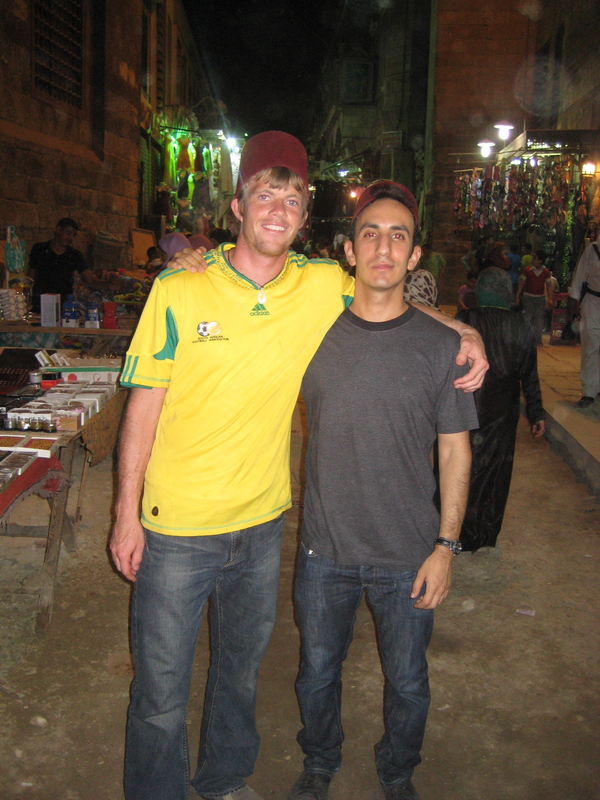 Before I begin, I have to give a shout-out to my friend Teymour for letting me stay with him and showing me around Cairo. I find it strange that traveling can turn normally uninteresting activities into amazing experiences. Like any tourist I had to get souvenirs, so Teymour and I went to Khan el Khalili market. A boring cab ride turned exciting when my friend tried to pay the driver. As soon as the the cab driver counted the money he began yelling. I don’t speak Arabic, but I assumed that he felt we didn’t pay him enough (I’ve never had anyone yell at me for paying them too much). My friend said something back at the cab driver. The argument went back and forth like a ping pong match. Finally my friend told me to get out of the taxi. The driver parked the car and got out and continued screaming. By this time people in the marketplace were watching the spectacle as if it were their favorite morning soap opera. Luckily it was a short episode because a police officer came over and spoke to the driver and he got in his taxi and drove away. I asked Teymour what happened and he said that the driver was trying to rip us off because he thought we were tourist. Then he said the police officer told the driver he couldn’t park where he did so he had to leave. This left me confused for two reasons: 1. Why did the taxi driver think my friend was a tourist? He’s Egyptian! (I assume he thought I was a local) 2. Why did the yelling between the driver and us not even phase the officer, but the inconvenient parking caused him to confront the taxi driver? After that experience I knew it was going to be a great evening. 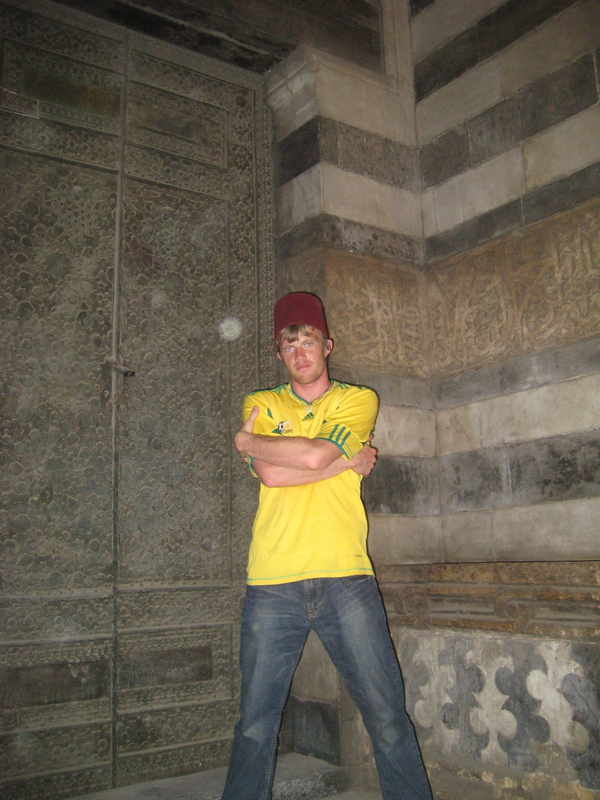 My first stop was to get a Tarboosh (Fez hat). I ended up getting two and made my friend wear one. He needed help blending in and I thought a Tarboosh would do the trick (look at the picture to the right, with a Tarboosh I blend right in). Teymour then began describing to me the history of the Tarboosh and that hardly anyone wears them now because it used to be a symbol of oppression. Let’s just say I let him stop wearing it after that. 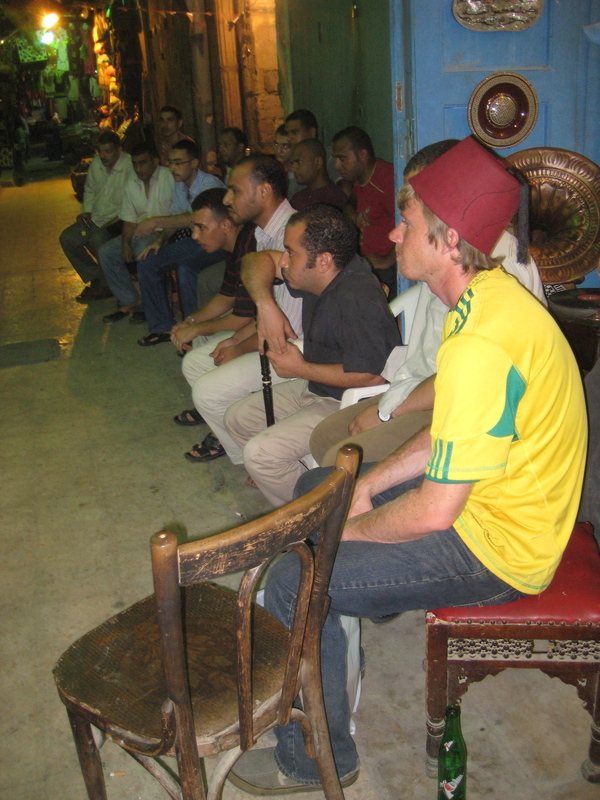 As we walked through the crowded market, we came to an alley with people sitting around watching soccer. Instead of walking by we stopped and started to watch the game. Immediately one of the storekeepers went into his shop and grabbed two chairs for us. We sat and watched the rest of the match with everyone. It was a lot of fun cheering with everyone during the match. It made me feel that I fit right in with everyone else (luckily Teymour told me who to cheer for or else I could have been in trouble cheering for the wrong team). By the time we left some of the stores were closing, so I finished getting souvenirs and some spices. We then went to El Hussein Mosque. As we looked around we heard some music playing and decided to check it out. We went inside an old building and at the end of the hall was an open courtyard with a band playing and a bunch of people sitting and listening. The atmosphere was awesome because we were sitting in a large courtyard in the middle of an old home. The band was playing folk music, but it was unlike anything I had seen before because the band was huge. There were a ton of instruments, several singers, and a few band members dancing around on stage. Although I couldn’t understand the songs it was a lot of fun to listen and enjoy the culture. During the concert Teymour said, “that’d be funny if you got on stage and started breakdancing.” I took his joke as a suggestion and asked, “do you think they’d let me?” He immediately replied, “you wouldn’t do it.” With that challenge I went up to the stage and asked if I could dance along with the band. They let me up on stage and I danced for an entire song (the song was 8 minutes long). I’m not sure how they could tell I wasn’t apart of the band, but everyone was laughing as they watched me dance around. I was happy with my performance because other crowd members got up and began dancing in the aisles. I love traveling because there is no such thing as an ordinary time souvenir shopping! You voted and I am going to Peru! Thanks to everyone who participated (if you didn’t vote you’re weak sauce!). I’m really happy about everyone’s decision, especially because I have wanted to go to Peru for a long time. Unfortunately because of work, I will not be able to take this trip until November or December. This will probably work out for the best so I have enough time to plan. Yes, I said plan. Usually I don’t plan my trips, but there is now a restriction on the number of people that can visit Machu Picchu each day so I have to get tickets early. As of now my plans are to visit Machu Picchu, take a boat ride along the Amazon River, and hike around Huascaran. This should be an awesome experience and I can’t wait to cross a few items off my bucket list. Since the whole idea behind this trip was to get other people involved in my adventure, please comment on places you’d like me to visit, things you want me to do, and food I should try. I’m open to any suggestions or ideas! The votes are in and it looks like I am going to South America! It was a really close competition between Asia and South America, but in the end South America won by one vote. I would have been happy to go to either continent (I’m just glad North America didn’t win because I had some friends wanting to send me to Orem, Utah!). Thanks to everyone who voted. Now it is time to vote which country in South America you want me to visit. In your vote you can include cities you want me to visit, activities I should do, things I need to eat, or sites you want me to see. Get creative because I will select a few ideas and do them. When I do them I will include it in my blog and give you credit for the idea. Yes, you could actually be mentioned in my amazing blog. Imagine the fame and glory! To vote for which country I should visit in South America leave a comment below. Voting starts today and ends at midnight on August 2nd. Get voting and spread the word! Send me anywhere in the world. I have been waiting for months to post this. It’s that time again! Every year I go on a crazy adventure, and this year is going to be no different. I have traveled without plans, rode through 3 European countries on a bike (even though I’m not a cyclist), and did almost every crazy thing you can in New Zealand from sky diving to ice climbing to white water rafting. This year I wanted to do something that hasn’t been done before. That is where you come in. For this trip I am going to let you choose where I go, what I do, and take any request that you might have. I will explain how this will work later on, but first I want to explain how I came up with this idea. 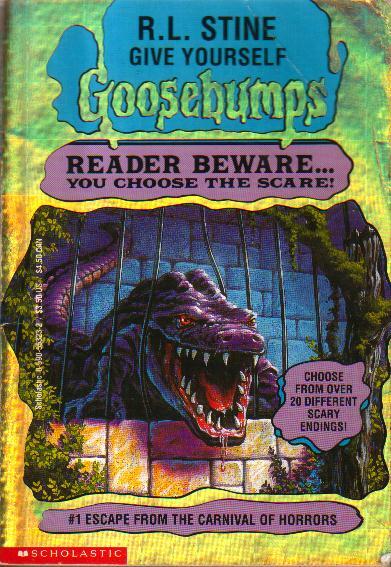 Do you remember reading Goosebumps growing up as a kid? The choose your own adventure books from that series were my favorite. Even though my choices often led to the death of the characters, I loved how the books allowed me to participate in the adventure. One day as I sat watching Anthony Bourdain’s show No Reservations, I thought “who is this show really for?” Sure the show was interesting while providing a preview of the country he was visiting, but who decided he should go to India and talk about cricket? Is that truly what viewers wanted to see or learn? This was how my idea was born, combining choose your own adventure with travel (hopefully you are better at “choosing your own adventure” than me because this character doesn’t want to die). I want you to be able to join in on my adventure. Everyone who has subscribed to my blog can vote and help create my next trip. If you haven’t subscribed, all you have to do is enter your email address under the subscription title on the left side of my blog. This will notify you when I have entered an amazing new post! There will be different periods of voting, which I will inform you about on my blog, Facebook, and Twitter. The first voting period starts today and ends on July 27th at 11:59 PM. You will be voting for which continent you want me to visit. All you have to do is leave a comment below this blog post stating which continent you want me to go to. 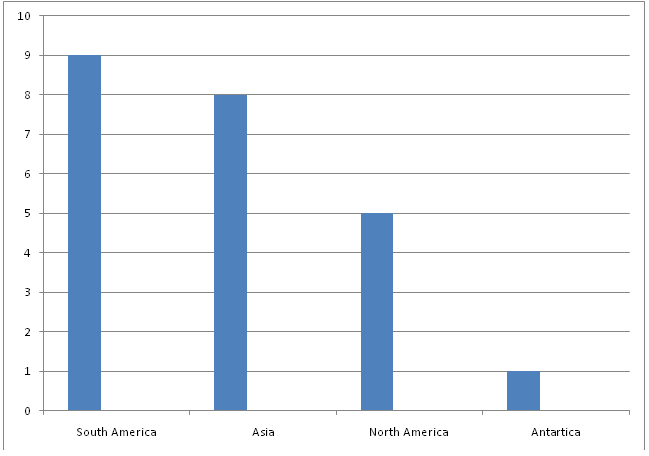 The next voting period will start after I have posted which continent got the most votes. You will then be voting for which country you want me to visit within the chosen continent. I’m really excited because I have never heard of anyone doing something like this. Remember you must subscribe to my blog to vote or else it won’t be counted. Spread the word and vote! I don’t like making recommendations without trying the product myself, but I feel very safe about this recommendation. Recently I discovered a site called TravelZoo. The website offers cheap flights, cruises, hotels, and vacation packages. In a couple of months I will be planning a big trip and TravelZoo will be the first on my list of sites to visit. I have seen some of the lowest priced domestic and international flights. From the reviews I have read about TravelZoo there are a few things you need to be careful of. My main recommendation is be SMART! Of the few negative reviews I found, most people were upset because they got something they didn’t expect. Some people got a hotel that wasn’t as nice as they thought or they thought they were getting more activities on a travel package than they did. To avoid this problem, read the description carefully, look up the hotel or airline that’s being offered, and research other deals. As soon as I plan my next trip I will let you know how it goes with using TravelZoo. If you, or a friend, have used TravelZoo comment about your experience. Comment on any other websites you have used. I recently noticed that I have not talked about food in any of my posts. There are shows, books, and blogs dedicated to writing about the foods of different cultures. When I arrived in South Africa I did not know what to expect food wise. I had never heard much about South African cuisine, but after my first meal of chicken curry, I was in love. Although South African curry is similar to Indian curry, there are slight differences. South African curry isn’t as thick, the chicken and vegetables are cut larger, and it doesn’t use as many spices. The coolest thing I ate was chicken curry in a bun (it’s called a fat cake). The bun is deep fat fried dough, which allows this meal to be eaten on the go without a large mess. It’s tasty, it’s great, it’s curry on the go! One of the weirdest things I ate is called Walkie Talkies. It is cooked chicken legs and chicken heads. There is very little flavor because I think it is only seasoned with salt. Although the taste wasn’t bad, the texture was a little rubbery. What made this South African treat so weird was that the feet still had nails and the head still had the beak. You stick the entire leg (nails and all) in your mouth and then you use your teeth to scrape off the skin and meat as you pull the leg out. After some curry filled fat cakes and Walkie Talkies, what could be next? How about cooked sisters? This was my favorite South African desert. You deep fat fry dough and then roll it in coconut flakes (for extra taste you can add sugar). Cooked sisters taste so good, and the coconut makes it seem that you are eating healthy. 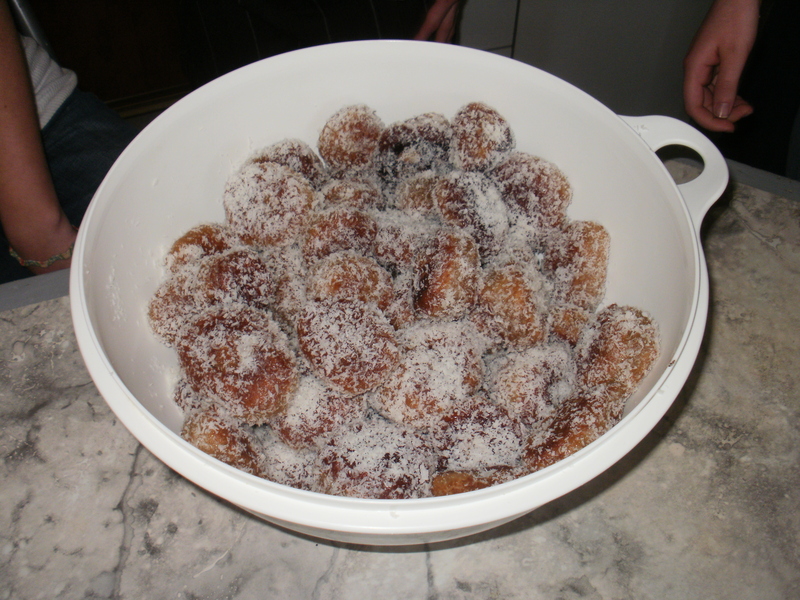 Basically it is a healthier version of donuts…maybe not healthier, but Cooked Sisters are so good! Before I can even think about concluding this intro to South African cuisine I have to mention braais. Braaing is a way of life, and a very serious custom. 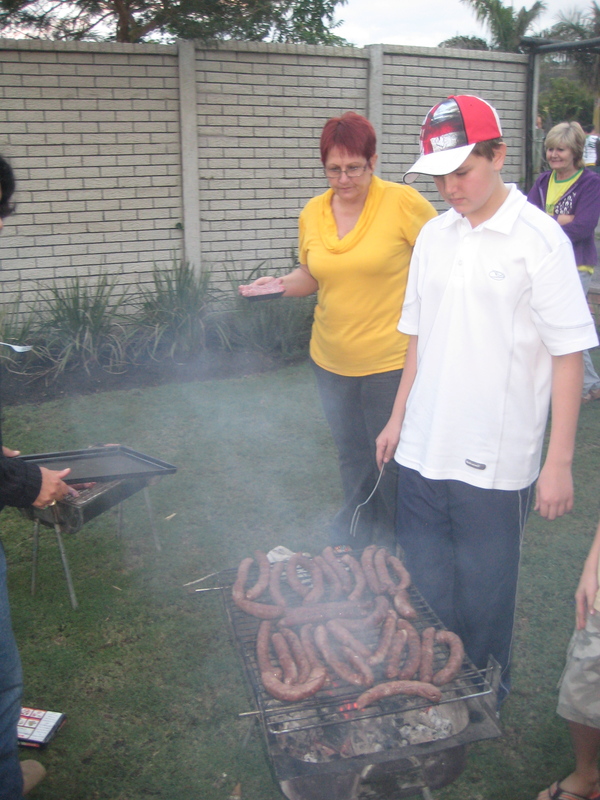 You make a fire in a pit, put a grill on top and cook boerwors, sosaties, kebabs,chicken, steaks, sausages, etc. Although the food is wonderful, it is the social aspect of this meal that was my favorite. All the men gather around the braai and talk, while the women gather in the kitchen and prepare the side dishes. Once the meat is cooked everyone gathers together, eats, and talks. It was a lot of fun and reminded me of a BBQ at home. 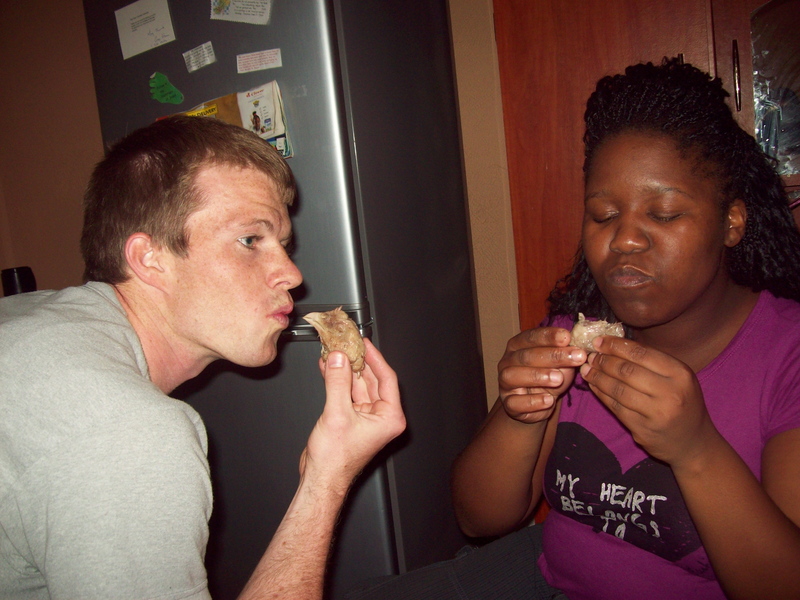 If you go to South Africa you have to partake in curry filled fat cakes, walkie talkies, fat sisters, and a braai.